SwitchUp sat down with UI/UX alumnus Daniela to find out more about her journey. She wasn’t happy with her job prospects, she starting doing some intensive research on bootcamp programs. Knowing exactly which languages she needed to learn, she pursued the Coding Temple program. Now she has a job at the same company her mentor worked for. Her goal for the future? To keep studying and become a development master! Learn more about her journey below. Your educational background is in Environmental Science. What ignited the switch to UI/UX? I wasn’t super happy with the type of jobs that were available in Chicago for environmental science majors, so I got a job at a library. While working there, we had a lot of downtime during the day, so I picked up coding as a fun thing I could do at work to keep myself engaged. I enjoyed it so much, that I made my own website and started looking for IT related jobs. I landed one as a technical support specialist and also did some light website design work. After Coding Temple, my focus shifted to front-end development, but it didn’t allow me to be as creative as I wanted. Luckily, my company doesn’t have a design department, and people kept coming to me for design work! Do you feel Front End Development and Environmental Science are at all related? If so, how? I don’t think that they’re really related, but I have seen job postings for non-profit environmental organizations who are looking to high designers and developers to build neat apps and websites for them. How did you decide to attend Coding Temple? What made it the right program for you? I did A LOT of research on coding bootcamps in Chicago. There were a few others that were more popular, but they were all teaching Ruby. A lot of startups are using that but larger companies….not so much. My plan was to work for a larger to mid size company, and I knew they would be using technologies like Java, C#, and .NET. Coding Temple was the only .NET full stack bootcamp in Chicago. I chatted with one of their instructors and looked up reviews from their alumni. Coding Temple seemed like the best fit for my needs. You currently work as a Web Developer for MedSpeed. What does this title mean and what does a normal day at work look like for you? Web Developers can work on any web based application or website. They typically are full-stack or have a focus on back-end or front-end. My focus is front-end and a little UX/UI design. The day starts with a team stand up, where we go over work that was done yesterday and what we’ll be doing today. Every other week we have demos of our work to show new features or bug fixes to the business side for feedback. Outside of that, a lot of my time is spent coding, designing layouts, and gathering feedback. Have you faced any challenges trying to become a Front End Developer? For me, it was finding a mentor on my team who had the time to help me better myself as a developer. Going to a bootcamp for 10 weeks can only teach you so much; the rest needs to be learned over time as you do actual work and build apps. Since MedSpeed has a smaller development team, it’s been hard getting that mentorship that I need. Has Coding Temple helped you to get a job in your field? If so, how? My instructor at Coding Temple was a contractor at MedSpeed. He heard they were looking for more developers and put in a good word for me. I ended up working on the same application he built! That was kind of neat. Where do you see your career heading in the next 5-10 years? Now that I’ve had my hands in both front-end development and UX/UI design, I’m hoping to continue building my skills in both areas and become a sort of dev/design master. What makes you most passionate about the world of Front End Development? There’s always something new to learn. It never gets boring, that’s for sure. If you could go back and give yourself one piece of advice before pursuing this track, what would it be? Network! Everyone you meet could be a possible job opportunity. You’ll need those connections after you “graduate” and even maybe a year or 2 from then. Do you want to learn more about what alumni have said about Coding Temple? Check out our page on SwitchUp. The digital age has brought with it some powerful winds of change. Over the last 15 years, there has been a remarkable amount of growth in the technology industry, to the point where the supply cannot meet the demands. So now people are wondering what is the better choice, a Computer Science Degree vs Coding Bootcamp. There are far more jobs in the tech-space than can be filled by the number of people that know how to do them. Due to this, the pay is high, the flexibility of remote work is present, and job security is certain. But how do you choose between one or the other? Do you believe you have what it takes to pursue this career in the first place? So you’re looking to pursue a career in the exciting and secure field of technology. Jobs in technology are projected to grow by 19% between 2016 and 2026. Considering 19% is significantly higher than the average growth rate for any career, a Computer Science Degree is certainly worth it when looking at the surface. The median annual wage for computer and IT occupations was $84,580 in May 2017, which was higher than the median annual wage for all occupations of $37,690. However, typically jobs that come with a high wage come with a high cost of tuition. The average public, out-of-state college costs over $140,000 to obtain a Bachelor’s in Computer Science. On top of that, 71% of the students need to take out a loan in order to make it through. Though many employers put great value into a CS Degree, they also are aware of the tuition cost, the lack of diversity and that having a degree doesn’t necessarily mean the graduate is talented. Getting a degree for any field usually requires you spend money on courses that have absolutely nothing to do with your career path. Up to 30% of your tuition may not have anything to do with Computer Science. If you don’t sign up for next semester’s courses quickly enough, you risk graduating late or having to take a class that’s not helpful for pursuing this field at all, such as pottery or music theory. This is already a compelling argument in deciding on a Computer Science Degree vs Coding Bootcamp. Two other options you may consider are to teach yourself or attend a Coding Bootcamp. There are many self-help guides and online courses to learn how to program, which would be the cheapest method. But they don’t necessarily get into the depths of how to problem solve for some code. Coding Bootcamps, however, do have the seasoned instructors you would encounter in a regular 4 year degree. The instructors are required to have 5 professional years minimum in the field in order to offer the most to your learning experience. Some bootcamps add data science into the mix, and almost all bootcamps fit in several other programming languages so you get the same, diverse knowledge you would receive at a 4 year school. The goal of Coding Temple’s Bootcamp is to get you as close to the CS Degree level as possible, focusing only on the absolute necessities. Short answer: YES. Statistically, Coding Bootcamps on average receive an 8.3/10 stars across them all. Some Coding Bootcamps get 9.9/10 stars depending on their level of dedication to pre, present and post success for the student throughout the course. Coding bootcamps are ~14 weeks long and the average coding bootcamp graduate earns $70,698 overall. If you want the long answer, research a little more into how Coding Bootcamps stack up against traditional Computer Science degrees. Overall, 75% of coding bootcamp grads are employed full-time and take 1-6 months to get their first job. Coding bootcamps are often considered a “fast track” to well-paying tech jobs. Networking with other tech professionals and utilizing the coding bootcamps career services help is vital to landing your first job. Whoever you decide to go with, be sure to keep in touch with their staff members. A good Coding Bootcamp will teach you how to program, but a great Coding Bootcamp will push you to your limit. Many Coding Bootcamps try to shuffle in as many students as they can (around 20 or more) then push them out the door when the course is done ~14 weeks later. With all of these students and one or two instructors, the students will likely not experience a lot of their own one-on-one help time. Coding Temple’s Bootcamp is designed to only have a maximum of 10 students per class, and each class that goes above 7 students has a teaching assistant. Coding Temple values the needs of their students and the knowledge they should have at the end of the course. From resume prep to mock interviews, acquiring local companies and recruiters to review Capstone projects and more. Their philosophy is student-centric, meaning they do what it takes to ensure the student has everything they need to succeed when they graduate. $11,874. That’s it, that’s the average cost. Even if you are just getting into the 80th percentile of someone who has obtained a 4 year computer science degree, this is an undeniable bargain. On average, only 25% of Coding Bootcamp students have to take out a loan. One aspect employer’s love about Coding Bootcamps is how it brings diversity to their work space. On average, 15% of Computer Science Degree graduates were women, and 10% were non-white americans. On the flip side, women make up 43% of Coding Bootcamp graduates while non-white americans make up 25%. How long are Coding Bootcamps? Coding Bootcamps can run anywhere between 8 to 104 weeks and strictly focus on programming. 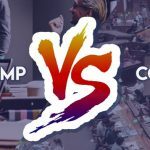 It really depends on what you’re looking for, how much time you have, whether or not you have a day job and other responsibilities that will make you decide what Coding Bootcamp is right for you. It’s important do to your research and play around with some languages beforehand to see what you like, think about exactly what industry you want to be in. Do you want to create video games? Do you enjoy data science? What about UX/UI design? The possibilities are endless, but it’s important you chase something you would enjoy, rather than what would make you themes money. Realistically, some of the lowest paying coding jobs are still double the pay of the national average. And since it’s all so versatile, you could sit down at a cushy salary job or end up working for yourself remotely, doing web development or consulting. 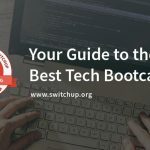 There are many factors to consider when choosing between a Coding Bootcamp and Bachelor’s Degree in Computer Science. Ultimately, you should be researching the reviews of past alumni before making your decision. This will tell you more about the quality of the education at either location. If you’re a high school student that wants the college experience, a degree is likely for you. If you’re someone looking to get into a new career quickly, we’d recommend a bootcamp. If you’re looking to gain freedom as quickly as possible and are more than willing to dive deep into the pre-work – you should check out our courses out at Coding Temple. Q: How much experience did you have before entering Coding Temple? A: Well, I had only done a couple courses on code academy, and played with that for a bit. So I had very little. Q: What course did you end up choosing at Coding Temple? A: After talking with Frank and Ripal, I decided to take the .NET and C# course. The variety of options that came with that course matched my aspirations better. They were helpful in guiding me towards the course that ultimately led me to my title of Software Configuration Engineer at Thatcher Technology Group. Q: What was your inspiration for the site? Was it an enthusiasm for dogs or were you planning to have this site as a passive business? A: I didn’t really plan on it being a passive business, but it certainly could be! The price is arbitrary, just a feature I wanted to add to the site so I could demonstrate my capabilities. When researching what to do for my Capstone Project I remembered how animals boost team morale and moods. I decided to create my Capstone based on this aspect – which was exciting because my instructor, Joe, thought it was unique. Q: What languages did you use to put the site together? Q: What was the most difficult challenge you faced when building the website, and how did you overcome it? A: I’d say linking the pages together, linking the front end and back end. I’d have these bugs and I couldn’t stop wondering where my code was breaking. Joe would walk through challenges, and I would take extensive notes, I found I was able to problem solve based on the notes I took. Q: How much of your Capstone Project was you being able to solve it? Whenever you needed help from the instructor, was he able to provide you with the solutions? A: I must have written down every word Joe said haha. So I’m going to give 40% credit to Joe – because I would always just refer back to the notes I took if I got stuck, and I found those very helpful. About 60% of the project I could figure out on my own without opening up my notebook. Q: Would you say your experience at Coding Temple was satisfactory and recommendable to our readers? A: Definitely – I would not be where I am today without Joe. He was knowledgeable, thorough and patient. I loved his teaching style and he helped me write a strong resume that helped me get the career I have today, it has only been 4 months since I graduated. I’m grateful to everyone who has helped me at Coding Temple, and I would highly recommend this to others looking to change their career.